How are you all? Today I am showing you some pictures of party favours and invites I made for a 13th birthday party at the start of the year. I made 100 invites and favours with thank you notes stuck on them. The invites were 4x6 inches or 10x15cm. I used most of the products from the spring/summer catalogue. Sadly they have retired but there are so many great replacements in the new annual catalogue that you can easily re-create something similar. I will link to my suggestions below. 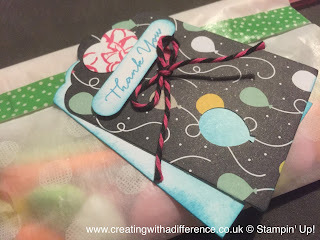 I have added some DSP, washi tape and stamp sets that will create a very similar design however you can just use the basic design I have and change up everything else. 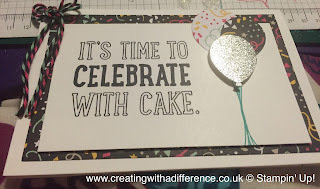 That is the brilliance of Stampin' Up! everything coordinates so you can use anything and if one thing retires something better comes in! I also sponged the edges of some of the layers to add some dimension. The things inside the party favours are some chocolates, glow sticks and sherbet sticks, These really were a great hit! I used SU glassine bags, I think filled them with the treats and stapled them shut with SU hand held stapler. I covered the join with some washi tape and add the tag on the front. These are so simple to do it's amazing. If you are in a fix of what to do go with simple! Embellish it and everyone thinks you paid a fortune!